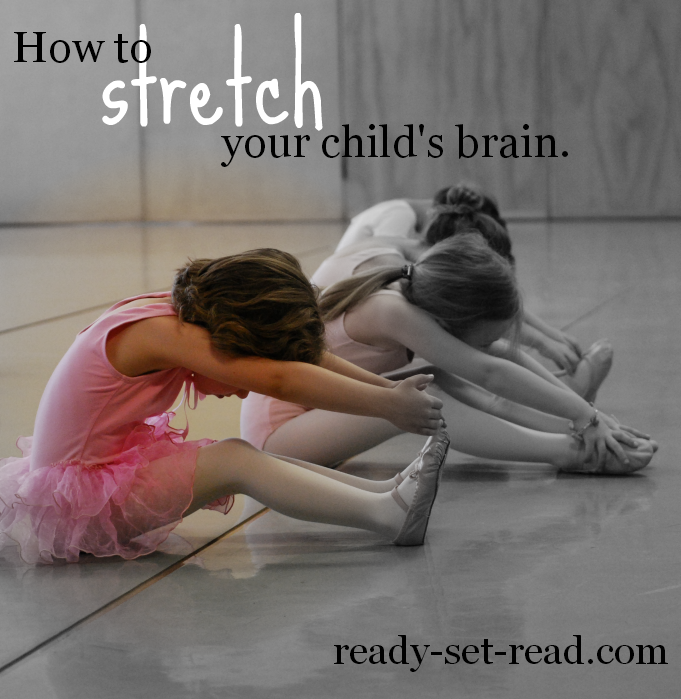 If you spend time reading educational blogs like ready-set-read, I have a feeling you have a desire to stretch your child's learning. I love to watch my boys develop and acquire new skills. I love to celebrate their abilities. I also love to think about ways to lift them to the next level of learning. Good teachers are always on the lookout for ways to increase rigor, to build problem solving skills, and to move children up to the next level. Each week on Mom's library, I find activities that help stretch my children's thinking! 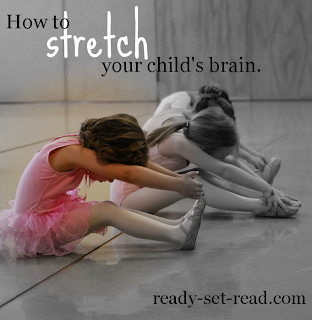 Today I am sharing ways to stretch your child's brain along with practical activities from mom's library participants. 1. Keep learning hands on-- Hands on learning provides opportunities for problem solving and higher level thinking. Block play and building toys are a great example of hands on learning. Check out these 15 Brilliant Building Toys from Mums Make Lists. 2. Engage multiple senses-- When children use more than one of the five senses, their brains are more easily able to transfer the knowledge they are learning in new situations. Little Bins for Little Hands provides tons of sensory activities. We loved M is for Messy ABCs Sensory Play from Little Bins for Little Hands. 3. Let children play-- Rigorous learning doesn't mean, "sit at a desk and do stacks of work". Children learn well through play. Young readers and writers can do rigorous tasks like writing and reading while playing post office, for example. Here are 4 Ways to Make Your own Pretend Play Post Office from Buggy and Buddy. 4. Choose topics that interest your child-- my boys are really interested in spiders at the moment. I don't know if the interest stems from the fall season or the fact that they are boys, but I'm going to try these Montessori- inspired Spider Activities using Free Printables from Living Montessori Now at PreK + Sharing to meet their interests. 5. Engage in physical activity during learning-- Give the brain some exercise and then come back to difficult academic tasks. Here are 24 Fun Family Physical Fitness Activities from Every Star is Different. You can take little brain breaks with these activities and I bet your learning will be more productive! 7. Provide Opportunities for Problem Solving -- Children are able to accelerate their learning when they are given opportunities to solve problems. If we simply tell students information, they won't remember the information as easily as if they discover the information. I love this Exploring Water (Science with the Magic School Bus) from School Time Snippets for problem solving. 8. Read a lot. Read more.--Here are 40 Family Friendly Halloween Books from The Jenny Evolution to get you started. This week you can win a $50 gift card to itunes or google play. The makers of iTooch a comprehensive app that matches school curriculum is giving you the chance to win free apps! To read more about this amazing app, please go to iGame Mom’s Review. Great advice! We try to lots of hands-on activities in our house too.